The perfect calculated parameters of the E218SUB enables ultra-compact housing dimensions, unique in its class. With a weight of only 61.5 kg, the E218SUB is one of the most compact and lightest double-18" subwoofers in the world. 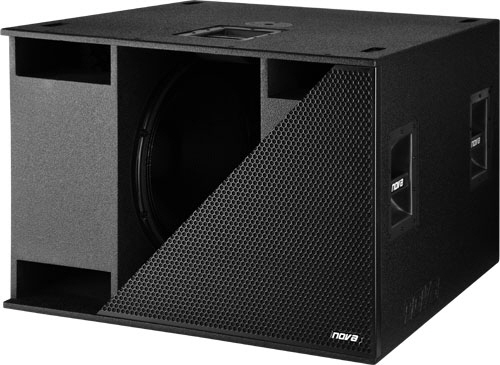 The E218SUB has exactly the same dimensions as the well-known single-18" subwoofer E18SUB (NOVA ELITE series). E218SUB - the dynamics Maximizer. A true dynamics wonder, which lets you enjoy the music much more. NIC | NOVA Pulse Compensation. The complete new and innovative NIC (NOVA Pulse Compensation) technology is based on a further development of a horn in combination with a four-chamber rear ventilation. The thus boosted subwoofer signal is divided into two parts. The higher frequency part is guided to the horn construction at the centre of the E218SUB. The lower frequency part is guided to the four-chamber rear ventilation. Both tuning frequencies are optimally adapted to each other. The achieved very high transient response results in a very precise bass reproduction with an immense dynamic range. The homogeneous dispensation of the higher and lower frequency range leads to a significant reduction of housing vibration. 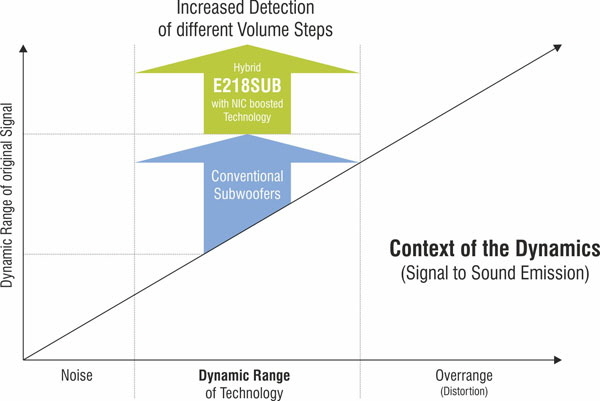 A further advantage of the hybrid NIC (NOVA pulse compensation) technology is a dramatic increase in sound pressure to a maximum value of 140 dB. If two or more E218SUBs operate in stacked applications above the other, the functionality of the horn increases even significantly more.